This month, the Carolinian (New York-Raleigh-Charlotte) celebrates 23 years of connecting the Tar Heel state with the greater Northeast. 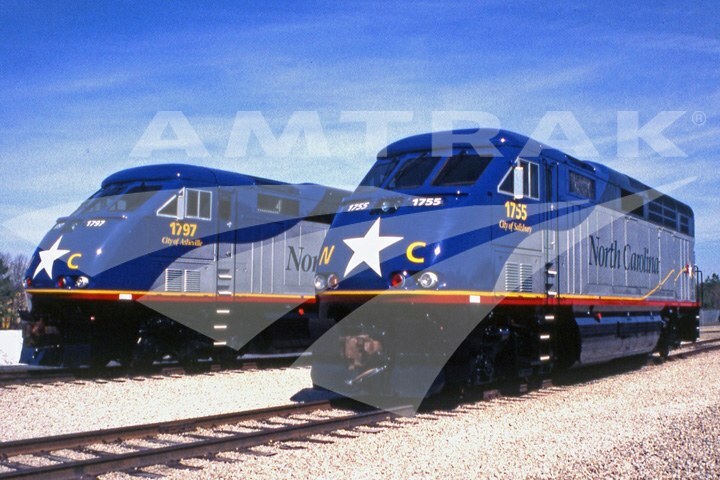 The start of service on May 12, 1990 cemented a fruitful partnership between North Carolina and Amtrak that continues today. Although ridership was strong with 120,000 riders, this early version of the Carolinian ended because typical passenger trips were shorter than expected and revenues therefore did not meet projections.3 Passengers tended to travel between cities within the state rather than continue to points north, which would have boosted the train’s overall financial performance. Over the ensuing years, the idea of a rail link between Charlotte and Raleigh did not fade from the minds of state transportation planners and rail advocates. In 1989, under the administration of Governor James G. Martin, the legislature created the Highway Trust Fund. While its primary purpose was to fund highway improvements, it also provided money for highway alternatives including intercity passenger rail services.4 Concurrently, a Rail Passenger Task Force submitted a plan of action for enhancing the state’s rail network, with renewed attention given to the Charlotte-Raleigh corridor. Thus, with the strong backing of the governor and legislature, North Carolina initiated the modern Carolinian service. The Carolinian's inaugural run began at the historic Rocky Mount depot. The revived Carolinian was similar to its predecessor in that it too was joined with the Palmetto for the northern leg of its route; but rather than connect the trains in Richmond, this maneuver was accomplished in Rocky Mount. On its independent run, the train would generally consist of a locomotive, two coaches and a café-lounge car. Throughout the day, residents of Wilson, Selma, Raleigh, Durham, Burlington, Greensboro, High Point, Salisbury, Kannapolis and Charlotte greeted the train with speeches, music and good cheer. Roughly 15 minutes were allotted for each whistle stop ceremony during which souvenirs were distributed. The Amtrak Archives holds a commemorative button from this tour; it features the train’s name embellished with a sprig of pine in a nod to the state tree. City of Salisbury (#1755) are used on the Piedmont service. A year after its launch, the Carolinian began traveling the entire New York-Charlotte route as an independent train. In 1995, it was joined by the Piedmont (Raleigh-Charlotte) to augment service within the state and provide a convenient schedule for business persons traveling between North Carolina’s two largest cities. The equipment used on the Piedmont is owned by the state but operated by Amtrak, and the locomotives are known for their red, white, blue and gold paint scheme echoing the colors of the state flag.6 A second Piedmont train was added to the schedule in June 2010. The North Carolina Department of Transportation (NCDOT) undertook many initiatives to encourage and sustain ridership. Partnering with Amtrak and local governments, NCDOT oversaw upgrades to a dozen station facilities. Historic downtown depots, many built in the early 20th century, were rehabilitated according to state and national historic preservation standards, while new facilities were constructed at Kannapolis, Cary and Gastonia. The NCDOT also sponsors two volunteer programs to enhance the passenger experience aboard state-supported trains and in stations. More than 100 volunteers serve as Train Hosts aboard the Carolinian and Piedmont, answering passengers’ questions about train travel and local transportation, offering advice on things to do and see at each stop and promoting rail safety. Station Hosts perform the same duties at busier stations including Raleigh, Charlotte and Greensboro. In addition to investing in rolling stock, stations and personnel, the NCDOT manages a comprehensive program for improving railroad infrastructure such as tracks and signal systems. Since the early 2000s, these improvements have contributed to a reduction in travel time of more than 45 minutes between Charlotte and Raleigh as well as increased system reliability. To celebrate the "long standing and progressive partnership between Amtrak and the State," the official Amtrak 2013 calendar features a beautiful view of downtown Raleigh framed by the state-owned locomotive City of Asheville (#1797) and Amtrak P-42 locomotive #120. North Carolina is one of 15 states that partner with Amtrak to provide expanded intercity passenger rail service. 3“Amtrak, state put train back on track,” Wilmington Morning Star, May 8, 1990. 4Walter R. Turner, The Future is Arriving (2012). 5“Piedmont Passenger Train Service Returns,” The [Lexington, N.C.] Dispatch, May 12, 1990. 6“New train to serve Piedmont,” The [Lexington, N.C.] Dispatch, May 18, 1995. 7Walter R. Turner, The Future is Arriving (2012).